ABAKULU okuva mu bbanka enkulu batunudde ebikalu mu kakiiko ka Palamenti akavunaanyizibwa okulondoola emirimu n’ensaasanya mu bitongole bya gavumenti aka COSASE, ababaka bwe babatadde ku nninga okuleeta lipoota eraga ebintu bye baasanga mu Teefe Trust Bank nga tebannagiggala mu 1993. Gavana wa Bbanka Enkulu, Mutebile (ku ddyo) n’omumyuka we Louis Kasekende nga bali mu kakiiko ka Palamenti aka COSASE. COSASE, ababaka bwe babatadde ku nninga okuleeta lipoota eraga ebintu bye baasanga mu Teefe Trust Bank nga tebannagiggala mu 1993. (2012), Global Trust Bank (2014) n’okuguza Crane Bank (CBL) eri DFCU bank (2016). Bbanka ya Teefe gye baasookeddeko okubuuliriza nga lipooti y’omubalirizi w’ebitabo bya Gavumenti yalaga nti Bbanka Enkulu mu kugiggala teyalina biwandiiko biraga bya bugagga bya Bank gye baggalawo. Akulira okulondoola emirimu mu bbanka z’ebyobusuubuzi, Tumubweine Twinemanzi yakkirizza nti kituufu ebiwandiiko tebaabirina. Ababaka okwabadde Moses Kasibante (Lubaga North), Medard Lubega Sseggona (Busiro East), Joseph Ssewungu (Kalungu West) baategeezezza nga bwe bataabadde bamativu ku ngeri bbanka ya Teefe gye yaggalwamu. Dr. Kasekende yabaanukudde nti mu kiseera ekyo mu tteeka kyali tekibakakatako kubeera na kiwandiiko kiraga ebyali mu bbanka gye baggaddewo n’agamba naye amabaluwa baagalina kwe basinziira okuggala bbanka ya Teefe. Notaries and Sebalu & Lule Advocates. Ababaka ba Palamenti baagala kampuni za bannamateeka balage obukakafu nga ddala basasula omusolo gwa VAT kuba ssente ze babanja ziyitiridde. President Yoweri Museveni has said that the Member of Parliament for Kampala Central Muhammed Nsereko is free to join the opposition if he so wishes. Museveni said the NRM fought for freedom and that is why nobody has died because of opposing government. Muuseveni was reacting to questions from radio journalist Thembo Mathias of Messiah Radio and Masereka Bernard of Guide Radio in Kasese during a prerecorded interview at State House in Entebbe, in which they wondered why an NRM member can come to the district to campaign for an opposition candidate. MP Nsereko has claimed he would travel to Kasese, an NRM stronghold to de campaign his party candidate. On the issue of Obusinga, Museveni said it was the NRM government that championed the return of Kingdoms to Uganda, adding that the issue in Kasese was delayed because there were local differences among the people of Kasese. “I heard Besigye telling lies that he is the one who returned Obusiga. Besigye was a student here in the 70s when we were fighting Idi Amin, why didn’t he bring the Obusiga that time or restore the Kabaka of Buganda or the other kings?. Kingdoms in Uganda were bought by NRM, nobody else. Besigye was a junior member in NRM. He joined in 1982 and he left to form FDC. He was not there when NRM started and he left,” he said. On the issue of corruption, the Museveni said while there may be some corruption among NRM members, the problem is widely spread and is worse in the FDC. “There is a lot of corruption in FDC as well. Bihande is or should be out of parliament by now and we should be having another by election in Busongora East. Stealing small money meant for the constituency, what would happen if he is a minister,” he said. The Anti-Corruption Court recently convicted Bukonzo East MP Yokasi Bihande Bwambale of embezzlement of the CDF worth shs20m. “We have provided institutions like the police and IGG etc institutions that follow up those who steal Money. The IGGs office was not there before it was started by the NRM government,” he said. Museveni said there is no way an opposition Member of Parliament working for the people because there is nothing they can do. “All the big projects are done by government whether there is an opposition or not. 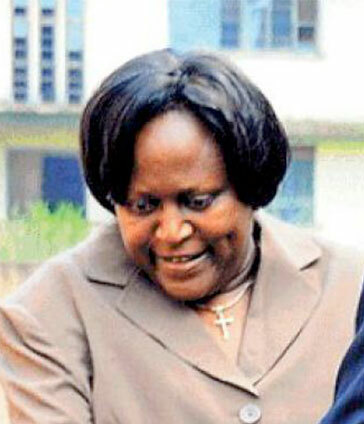 MPs can help with smaller things which the National Planning System may not address quickly including following up on issues like compensation, monitoring programmes etc but former MP Winnie Kiiza has never raised them because she is not in NRM. Adding that members of parliament are supposed to follow up projects and remind government on various issues. “Kiiza has never invited me to Kasese instead she invites Besigye. Besigye has no control of the money of Uganda, so what value is she to Kasese. But Muhindo will be a member of this family and we shall be able to assist her and she will be able to seek our advise,” he said. He emphasised various projects in the district including the rehabilitation of Hima Cement, improved road infrastructure, the upcoming Kasese Central market worth 12bn shillings and the upgrading of Kasese Airfiled that is due to be implemented. He also said government was considering implementing a cotton stabilisation fund to control cotton prices and that the Drug monitoring unit of State House is going around the country to address drug thefts. KAMPALA Capital City Authority (KCCA) and Huawei Technologies Uganda a Chinese company have disagreed on the maintenance of solar street lights that were donated to Uganda by Government of the Republic of China. KCCA officially received the solar street lights in July last year as a result of notes signed by Uganda and China in 2012 on the initiation of the solar street demonstration project aiding Uganda. However, the 98 lights stopped working nearly one year after installation on Kabaka Anjagala Road, Usafi Car Park, Nsambya Road, Mbogo Road and State House Close. KCCA deputy Spokesperson, Robert Kalumba told New Vision that when the consignment which came with a one year warranty started getting faulty, it kept on giving excuses until they (KCCA) decide to launch a technical investigation on what the problem was. Huawei is in charge of installing and maintaining the project on behalf of the Chinese government. He added that the entire solar systems including the panels were not accredited by any regulation standards body and they didn’t meet international standards. The donation which was expected to be a direct answer to perpetual load shedding in Kampala is said to have cost over $800,000 an equivalent of Shs3bn. “we have decided to remove all of them and I can assure you that before Pope Francis’s visit in November, we shall have finished installing new durable solar lights,” Kalumba highlighted. Asked whether discontinuing the project will not dent the Uganda-China relations as far as the 2012 notes signed are concern, Kalumba said the donation is not part of that government program. Allan Kyobe the public relations officer Huawei Uganda, dismissed allegations that they refused to maintain the lights is. Kyobe confirmed that with a letter dated 9th July, 2015 to KCCA, Huawei committed to reinstall the street lights with new batteries with work to be completed by 29th July, 2015. “Our maintenance works are part of the extended warranty period to KCCA to enable us address the solar street lights diligently with approximately 50 lights’ batteries being installed in the ongoing maintenance works,” he adds. According to Peter Kaujju, the authority spokesperson, KCCA is on the move to install more 500 solar street lights in the Central Business District (CBD) as an effort improve on the city’s security and cut on the cost of hydropower charges. He also disclosed that negotiations are on-going with the private sector to provide additional solar lights in exchange for street pole advertising rights. With KCCA’s monthly bill of sh80m to UMEME, Of the 1,200km road network in Kampala only less than 15% (115Kms) has street lights and currently with less than 8% properly functioning.